The importance of distribution channels is often overlooked when analyzing the evolution of disruptive technologies, however, few truly disruptive companies grow through traditional distribution channels. In many cases, the growth of the disruptive distribution channel paves the way for disruptive companies – allowing them to bloom by reaching non-traditional customers and eventually changing the way their industries work. One could argue that the success of both Google and Facebook stems from their creation of disruptive channels that eventually delivered the products from which their businesses were grown. For Google, their search engine created the channel by which ads could be sold; for Facebook, their social network created the platform by which marketing could be targeted. Disruptive distribution channels are essential for the growth of disruptive technologies in that they allow access to a new group of customers, those unreachable by traditional channels. Whereas disruptive technologies are discounted and undervalued in traditional distribution channels, new disruptive distribution channels create opportunities for novel technologies to satisfy a completely different set of needs. 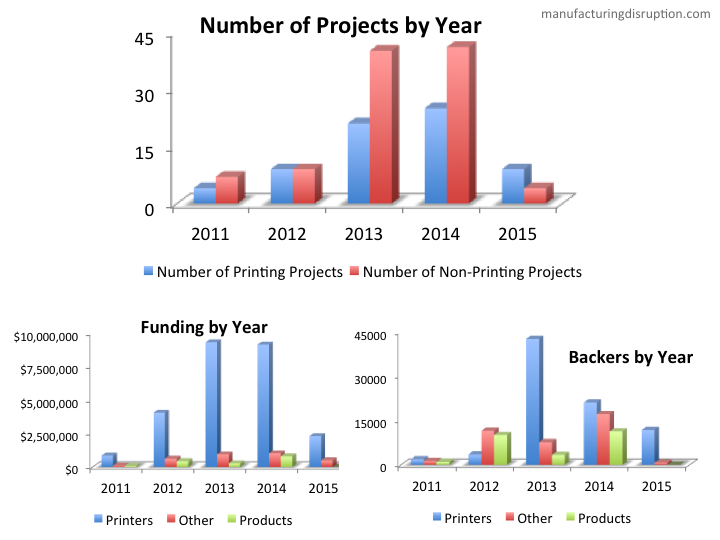 The growth of desktop/consumer additive manufacturing (3D printing) in recent years has been linked, in part, to the crowd-funding platform Kickstarter. Offering an economically attractive method for measuring consumer demand before investing in costly manufacturing, Kickstarter has provided countless would-be entrepreneurs the opportunity to enter the world of startups with minimal upfront monetary risk. It is important to acknowledge that while Kickstarter is probably the best-known crowdfunding platform, it represents a particular type of crowdfunding model: customers pledging funds towards the success of a project generally do so in exchange for some product to be received in the future, but only if the overall campaign goal is met. Many times, product delivery occurs months (and sometimes years) after the success of the campaign is confirmed. In this way, Kickstarter has become a very effective pre-payment platform. Pledgers are pre-purchasing projects, but are not gaining equity in the venture (as is the case of other crowd-funding platforms, such as Crowdcube). This distinction is critical for understanding the role of Kickstarter as a distribution channel – Kickstarter is not measuring people’s view as to whether the campaign represents a profitable venture, instead it gives a look at customer demand. The other critical factor that relates to Kickstarter’s status as a disruptive distribution channel is that active pledgers are not necessarily representative of mainstream customer behavior. Kickstarter customers are early technology adoptors: ready to accept new technology and patient as the technology is perfected. They trade performance for convenience and will accept imperfections as a consequence of “a technology that is almost there”. Thus, Kickstarter is not a long-term distribution channel for reaching a mass market and scaling sales. However, it can be used to establish a foothold and start to understand consumer needs and preferences. As Kickstarter’s popularity continues to grow, the type of customer it services will also evolve. While it is hard to imagine a day when mainstream customers will view the platform as a viable way to satisfy their needs, the typical customer profile inches closer to the mainstream, giving inventors progressively better information on what later customers will likely demand. Only successful campaigns were considered (or campaigns which were very likely to be successful at the time of the data pull in late February 2015). Funding and backers were updated for each project on 9 March, 2015. Market exchange rates current on 9 March were used to convert any campaign that was raised in a foreign currency (regardless of the date of success). While Kickstarter has been up and running since 2009, its relationship with additive manufacturing began in early 2011 and has been growing ever since. 3D printing enjoyed modest success fundraising on Kickstarter in 2011, taking in close to $1 million. Since then, the total funds generated by 3D printing-related projects has ballooned to close to $29 million ($25.7 million generated from campaigns focused on the design and manufacturing of the printers themselves), across 168 different (successful) projects while garnering the support of 119,103 backers. That represents 2.15% of the total (successful) funds ever raised on Kickstarter – impressive considering additive printing doesn’t come anywhere close to capturing that share in the overall US consumer electronics market. While 3D printing projects on Kickstarter raised over $10 million in 2014 ($9 million on printers), it is still only a very small sliver of the overall consumer / desktop 3D printing market. (Makerbot, one of the leaders in consumer printers, posted revenues around $100 million in FY14.) That said, that sliver holds a great deal of importance for launching new ideas, reaching customers and generating buzz. Kickstarter has been the platform by which new consumer printers have been birthed: most notably Formlabs, with the Form1 (over 2000 backers and close to $3 million raised), and 3Doodler, with two separate campaigns (over $3.8 million cumulatively raised) for version one and two of their 3D printing pens. Entrepreneurs looking to launch new printer designs have realized that the Kickstarter community offers one of the strongest platforms for testing their ideas with eager, early adopters and consequently these would-be startups have swarmed to Kickstarter, offering 68 different (successfully funded) printer designs. Its value as a launch platform is what makes Kickstarter a disruptive distribution channel for 3D printing. Kickstarter allows entrepreneurs to demonstrate (and experiment with) the viability of a product, and success on a campaign can generate support for a startup that otherwise would have been near impossible. Probably the best example of this within the 3D printing realm on Kickstarter is Formlabs: after raising close to $3 million for their Kickstarter campaign in October 2012, Formlabs secured a huge $19 million Series A venture capital investment round one year later. Printer – projects where the focus was the design and/or sale of 3D printers. Generally backers pledged money in exchange for a printer, once the design and manufacturing had been sorted. Accessory – the development of equipment or consumables that directly support/enhance the 3D printing process, but are not printers by themselves. Examples include new materials (filament, resins, etc) for printing, enhanced extruder heads, printer housings, controller electronics and devices to assist users in making their own filaments. Product – consumer products developed with the aid of 3D printing (acting as a significant value-added step). Examples include cases where the end product was printed using an additive manufacturing technique, where a mold for final production was created using additive manufacturing or where a prototype was first created using 3D printing (many times to offer a physical representation for the Kickstarter campaign). The numbers show that 3D printing activity on Kickstarter is centered around the construction and sale of the printers themselves. While accounting for just over half of the campaigns, printer projects captured over three-quarters of overall backers and over 90% of all 3D printer related funding (reflecting their comparatively higher price tags compared to other categories). As discussed in previous posts, one of the most interesting aspects of the growing additive manufacturing industry, especially the desktop / consumer segment, is the evolution of the ecosystem that surrounds it, to include software, 3D scanning, new materials for printing, communities working on the technology and finally the products that are being created by the printing capabilities. 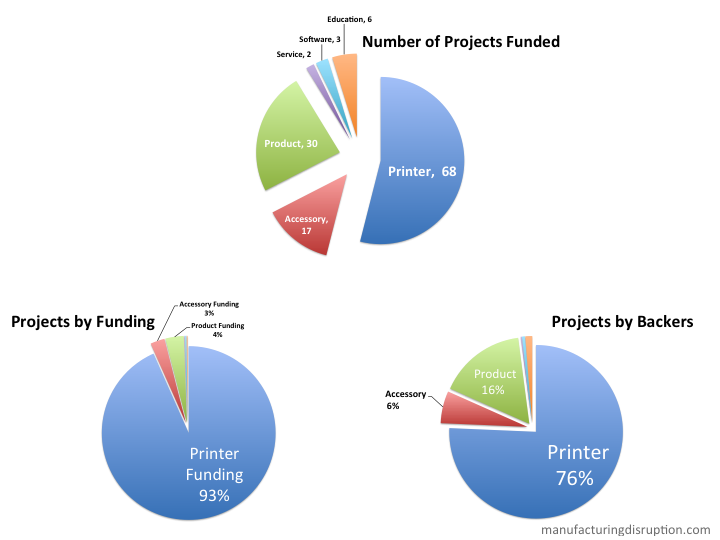 Although projects involving creating new printers still account for the vast majority of the funding generated on Kickstarter, there has been a growing number of (successful) projects centered around the rest of the ecosystem. As increasing numbers of customers are drawn into the world of additive manufacturing, they are demanding new services, software and accessories to enhance the experience and make it more productive. As more people begin to master the process of 3D printing, their eyes are opened to possibilities of new product development that otherwise might have been too difficult given traditional fabrication routes requiring expensive tooling. Despite the encouraging numbers, with $1.5 million in funding generated, I had expected to see more growth in the product category, especially in recent years. Although roughly half the funding accountable to 3D printed products on Kickstarter took place last year (2014), it is well off the pace generated by the printers themselves (around $9 million in 2014). There are a number of very good explanations for this disparity: a) printers typically command a much higher price point than the products created by them, so (in general) a comparable number of backers in each type of campaign will generate significantly more funds for printer campaigns; b) many product descriptions lack detail on production processes, so there could well be numerous projects that were not counted as they did not explicitly state the use of additive manufacturing; c) users of desktop 3D printers are still in the very early stage of the learning curve regarding additive manufacturing – they might be using early generation printers with limited materials and may not have succeeded at gaining access to more sophisticated printers. More than likely, the slow growth is a combination of all three factors, to varying degrees. It will be interesting to see if the number of 3D printed product-related campaigns surges in the coming years as users start to conquer the learning curve, becoming more productive with the printers they own and branching out to more sophisticated additive manufacturing techniques (beyond today’s desktop variety). An overwhelming number of Kickstarter campaigns revolved around Fused Deposition Modeling / Fused Filament Fabrication (FDM/FFF) technology (heated extrusion of thermoplastic materials). For anyone familiar with the technology, this should not be too surprising. Given the relatively straightforward nature of this method of printing, use of standard manufacturing plastics (thermoplastics such as ABS and polycarbonate) and the success in awareness and engagement generated by the RepRap project (an open-source platform for FFF technology), FDM/FFF has become the de facto choice for most consumer/desktop 3D printers and has generated $18.5 million in funding on Kickstarter (printer campaigns alone). Stereolithography / Digital Light Processing Stereolithography (SLA/DLP) technology has been the focus of a number of Kickstarter campaigns and while not posting anywhere near the number of campaigns, printer projects based in the technology have generated very large returns ($6.8 million), most notably Formlabs. SLA/DLP works by curing liquid photopolymers using light (usually UV) provided by some source, and in the case of DLP, a digital light projector. 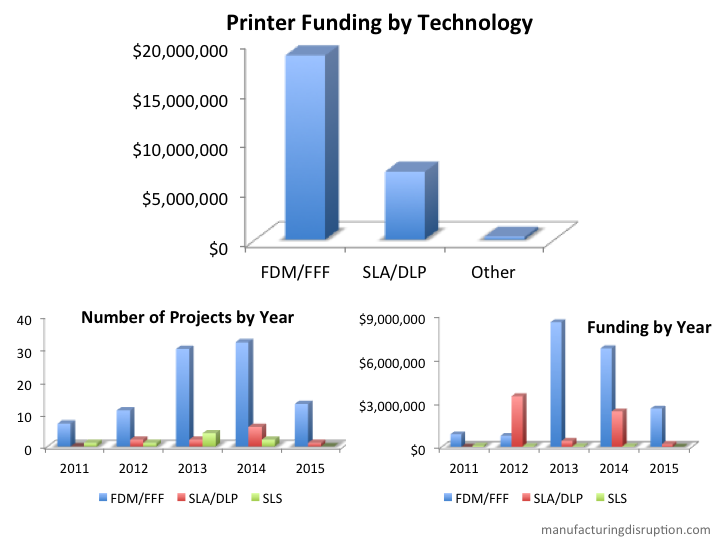 The disparity between SLA/DLP compared to FDM/FFF projects is an indication of the increased complexity of SLA/DLP techniques as well as the challenge involved to scale to lower costs. Despite the costs of DLP projectors dropping dramatically over the last ten years, the projector remains a prohibitive barrier to reaching price-sensitive low-end customers. That said, at least one campaign has attempted the challenge to deliver the printing technology at a $100 price point (despite raising $600k CAD, the challenge remains very real as after two years of development, the printers are yet to be delivered due to numerous delays as the inventor encounters the hurdles of scaling technology). Furthermore, while SLA/DLP has established itself as an ideal technology for rapid-prototyping, its use of photopolymers (as opposed to popular thermoplastics like ABS – the workhorse of injection molding) can make it unsuitable for producing end-consumer products. It can be inferred that many Kickstarter customers are looking to produce products that they (or their customers) can actually use, rather than looking at 3D printing as simply a method for rapid-prototyping. This shift in 3D printing mindset is important to the evolution of the overall technology, even if an unbiased view would conclude that the technology (especially in the case of FDM/FFF) has not yet truly evolved to the stage to really support the assumption that 3D printing is inherently meant for end-product production. Other technologies remain less accessible to Kickstarter, especially in terms of actual printer development. Basic Selective Laser Sintering (SLS) patents, for example, have just expired within the last 15 months, however, Kickstarter has yet to see any SLS-based printers. Again, a more complex technology combined with a likely much higher price-point makes the venture challenging. Furthermore, as there are a number of patents still well in place, building a complete SLS system would be difficult without violating some patents. Lowering costs: In order to appeal to a wider customer base, one the principle aims of a number of Kickstarter campaigns has been to lower the price of entry level printers. While mainstream consumers might be reticent to invest a few thousand dollars into a desktop 3D printer, the customer base significantly grows when the price is dropped to a few hundred dollars. Because of the open-source nature of FDM/FFF technology, new entrants are testing the lower bounds of the desktop printer market, while promising capabilities similar to (and sometimes exceeding) those of market leaders, such as MakerBot. Efforts are not simply limited to FDM/FFF technology. Although lower in number, some campaigns have focused on bringing down costs of SLA/DLP and have garnered significant support. Probably the most notable effort to create a new lower segment of the consumer printer base comes from 3Doodler, which has raised $3.8million across two separate campaigns. By separating a FDM/FFF extruder from the rest of the printer and converting it into a manual 3D writing pen, 3Doodler has pushed the entry level to additive manufacturing to $100. Although this lower end market will likely not yield large margins and profits in hardware production, profits will likely flow from filament sales – the all-too-familiar razorblade business model. Because profits reside in the filaments, the knock-on effect with ramifications across all FDM/FFF platforms is innovation in the filaments themselves. Looking into the future, we are left with the question: Does the future of FDM/FFF resemble the inkjet printing market (commoditized hardware with a profitable and proprietary consumable side business)? Increasing usability: In order to appeal to more mainstream customers, printers are evolving from user-assembly kits (Ikea for 3D printers) to printers with consumer-friendly compatibility and interfaces. Newer printers claim plug and play capability, wifi control and easy to use integrated interfaces. Furthermore, a number of campaigns have focused on improving software (both design tools and printer interfaces). By lowering the barriers to use, the user base can be increased and expanded beyond hobbyists to more mainstream users. Increasing capability: Early open-source 3D printers suffered from a myriad of problems: few build materials, slow build times, limited build envelopes. Although these limitations have not been fully overcome, the latest wave of Kickstarter campaigns are pushing the boundaries of what is possible. A number of campaigns have been spawned by materials scientists and chemical engineers expanding the materials palette. Meanwhile, a number of recent printer builds have promised much quicker build times, frequently making use of polar-coordinates using Delta FDM/FFF printers, which increase the efficiency of printer-head movement. Finally, every few months a new printer is released with a larger build envelope than previous competitors. Especially over the course of the last year, increasingly, new printer builders are taking established 3D printer brands head-on, comparing specs to commensurate MakerBot models, for example. It clear that the Kickstarter campaigns focus on early-adopters, technology enthusiasts that are willing to trade time (waiting – even years – for the makers to actually produce the printer and ship it to them) for performance and features. 2015 – a Banner Year? 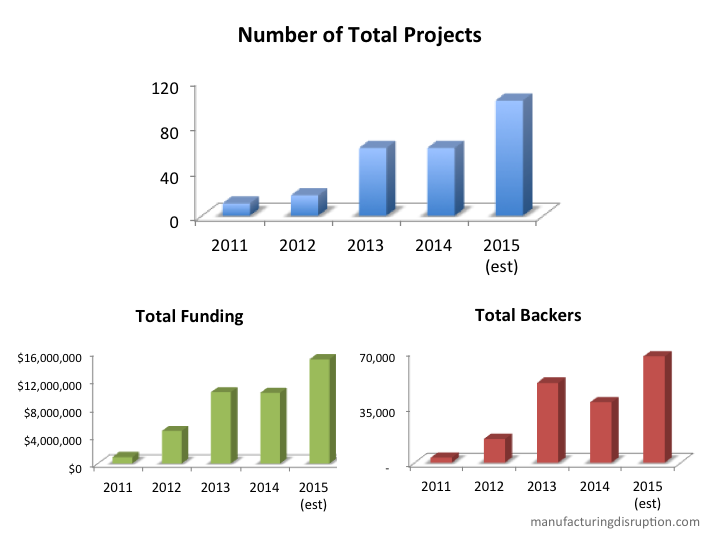 2015 has already started off strong for additive manufacturing on Kickstarter, raising close to $3 million from over 12,000 backers across 9 projects. The year has been highlighted thus far by the 3Doodler 2.0 campaign, which raised over $1.5 million. Beyond sheer numbers, the campaign is remarkable in that it was 3Doodler‘s second successful campaign on Kickstarter raising money for their handheld, extrusion-based 3D printing pen. Despite successfully transitioning from the platform to develop a direct sales channel through their own website, 3Doodler still chose to launch their new, improved pen through Kickstarter, underscoring the importance of Kickstarter as a distribution channel for reaching 3D printing early adopters. The early successes of the year are likely to skew estimates, but if the current pace continues, we could see $15 million worth of additive manufacturing funding on Kickstarter in 2015. The behavior of printer campaigns, especially those centered around FDM/FFF technology, is telling of an underserved market where capabilities have yet to meet user demand. Using the frameworks for disruptive technologies postulated in The Innovator’s Solution, Christensen and Raynor would predict integrated players pushing the technological capabilities of additive manufacturing systems until they can meet consumers’ needs. The large number of recent acquisitions in the additive manufacturing market by big players like 3D Systems and Stratasys reflect this state. However, the same logic would suggest that using traditional distribution channels is less than optimal and that reaching and establishing a new customer base is likely to come through the development of disruptive distribution models. This is why 3D printing marketplace models, such as Shapeways, have attracted so much funding and why traditional approaches, such as Makerbot attempting to sell through traditional channels (Staples, Home Depot, Sam’s Club and Dell) have so far performed poorly (likely a contributing factor to Stratasys’s $100 million write down on their Makerbot acquisition). While entrepreneurs hope to shape the future of additive manufacturing by creating their own disruptive distribution channels, Kickstarter has already emerged as probably the most important channel for reaching out to early adopters in the consumer/desktop printer market. From the outside perspective, the value is that current Kickstarter campaigns offer a perspective of what the market will likely resemble in 12-18 months time. By following the technology trends and observing what works (and probably more importantly, what does not), we can get a glimpse into the future of 3D printing and who will likely be the winners and losers. In the coming weeks, I’ll be illustrating some of the 3D printing technology trends on Kickstarter by highlighting selected campaigns that are pushing the limits of today. Posted in Additive Manufacturing, Advanced Manufacturing, Feature Articles, Technologies and tagged 3D printing, 3Doodler, disruptive technology, distribution channel, DLP, FDM, FFF, Formlabs, Kickstarter, SLA, SLS. Bookmark the permalink.